The Google Nexus 6 and Google Nexus 9 are a pair of devices running the new Android 5.0 "Lollipop" operating system, due to start shipping to consumers this November. Although there are several tweaks and enhancements with Lollipop, the main developments seem to be in the way it allows you to share data between different Android devices in your collection, such as your phone, tablet and smartwatch. The new version of Android will roll out to the Nexus 4, 5, 7 and 10 plus Google Play edition devices in the next few weeks. 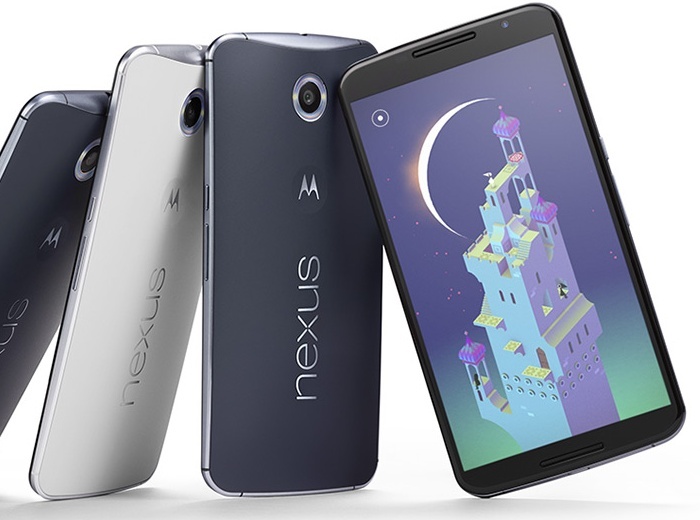 The Google Nexus 6 is Motorola's first Nexus device, and can be thought of as a scaled-up version of the second generation Moto X. Featuring a 6.0" 1440 x 2560 pixel display and a very fast 2.7" quad-core Qualcomm Snapdragon 805 CPU, this is certainly a big and powerful beast. Alongside the zippy CPU is a Adreno 420 GPU plus 32 or 64GB of non-expandable memory. Oddly, Google haven't mentioned how much RAM is in the Nexus 6, but unconfirmed reports say that it is 3GB. The battery is worth mentioning for two reasons - firstly it is a very large 3220 mAh unit, but also because it features the amusingly-named Turbo Charge which Google says gives six hours of use on only 15 minutes charge. On the back is a 13 megapixel camera with OIS plus a 2 megapixel one on the front. The main camera can capture 4K video at 30 fps which is pretty much the emerging standard for high-end devices these days, and it also comes with a dual-ring LED flash. This is an LTE capable device with NFC and of course if comes with all the features you'd expect to find in a modern top-of-the-range device. The Nexus 6 shares a lot of design characteristics with other Motorola handsets, making it distinctly a Motorola product. Available colours will be Midnight Blue and Cloud White, and the Nexus 6 will be available to pre-order in late October and will start to ship in November, although prices are not known at this point. HTC have partnered with Google before for Nexus devices, but the Google Nexus 9 is interesting because this is HTC's first tablet device for a very long time. HTC's previous tablet was the long-forgotten HTC Flyer launched three and a half years ago, but since then they have perhaps wisely avoided this particular market segment. This is an 8.9 inch tablet with a 2048 x 1536 pixel display, inside is a 64-bit Tegra K1 processor of unknown speed with 2GB of RAM and 16 or 32GB of flash memory, which isn't expandable and frankly seems a bit limited. On the back is an 8 megapixel camera with a 1.6 megapixel one on the front. 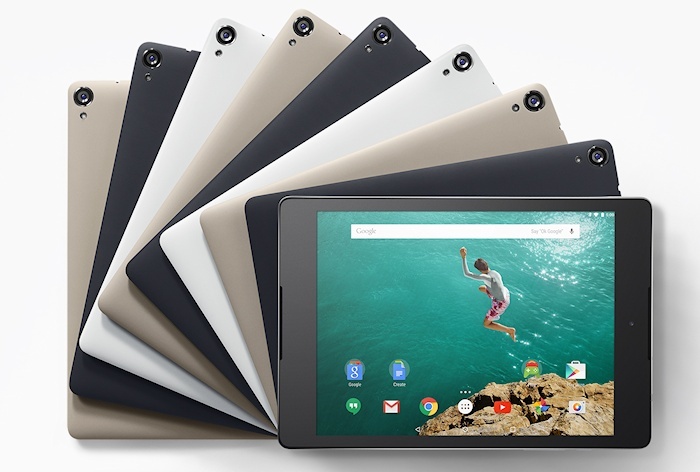 The Nexus 9 supports NFC and all the usual Android tablet features. The Nexus 9 will come in either WiFi-only or LTE-capable versions and packs a 6700 mAh battery. It is a very thin device at 7.95mm thick. The specifications are somewhat similar to the outgoing Apple iPad Air although the Nexus is a bit smaller and presumably cheaper, however by the time the Nexus 9 ships there could well be an updated version of that iPad. Google say that the Nexus 9 will be available for pre-order from 17th October and will be in stores from 3rd November, although we suspect that those dates might apply to the US only. Available colours are Indigo Black, Lunar White and Sand. Again, we do not have any information on price.